Piero della Francesca, original name Piero di Benedetto dei Franceschi, (born c. 1416/17, Sansepolcro, Republic of Florence [Italy] - died October 12, 1492, Sansepolcro), painter whose serene, disciplined exploration of perspective had little influence on his contemporaries but came to be recognized in the 20th century as a major contribution to the Italian Renaissance🎨. 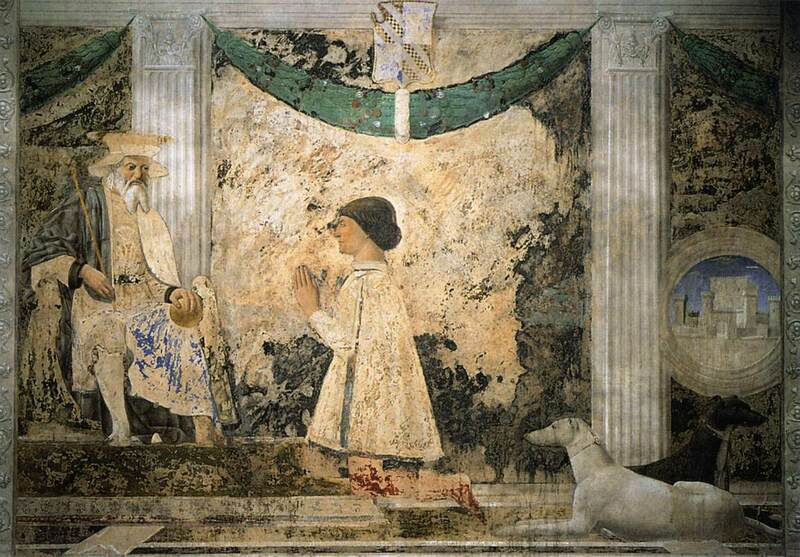 The fresco cycle The Legend of the True Cross (1452-66) ⎆ and the diptych portrait of Federico da Montefeltro, duke of Urbino, and his consort (1465) are among his best-known works. 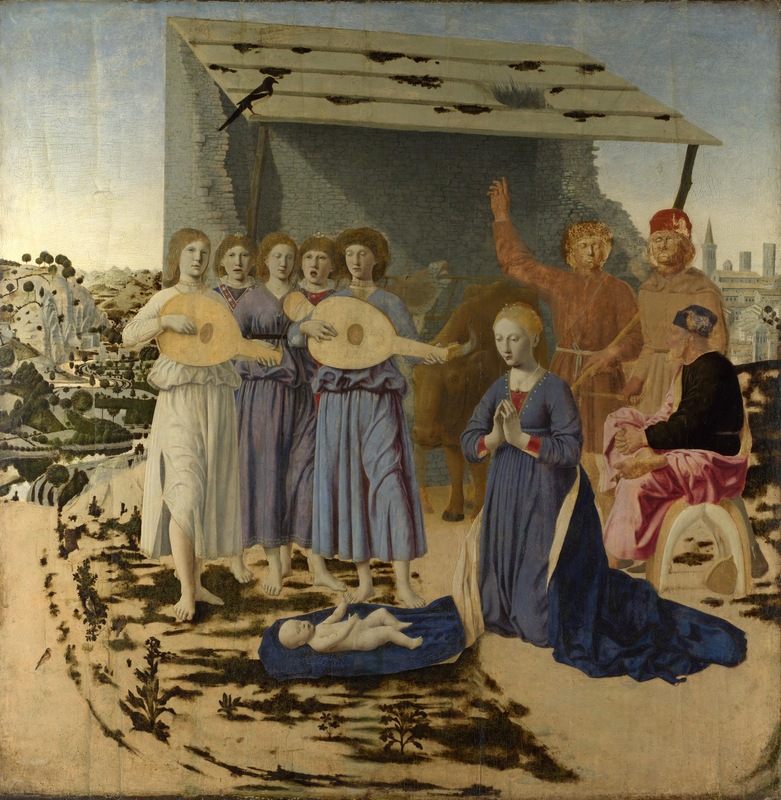 The documented facts of Piero della Francesca’s life, which are few, permit a reasonably accurate reconstruction of his career and interests but not an exact chronology of his surviving paintings. 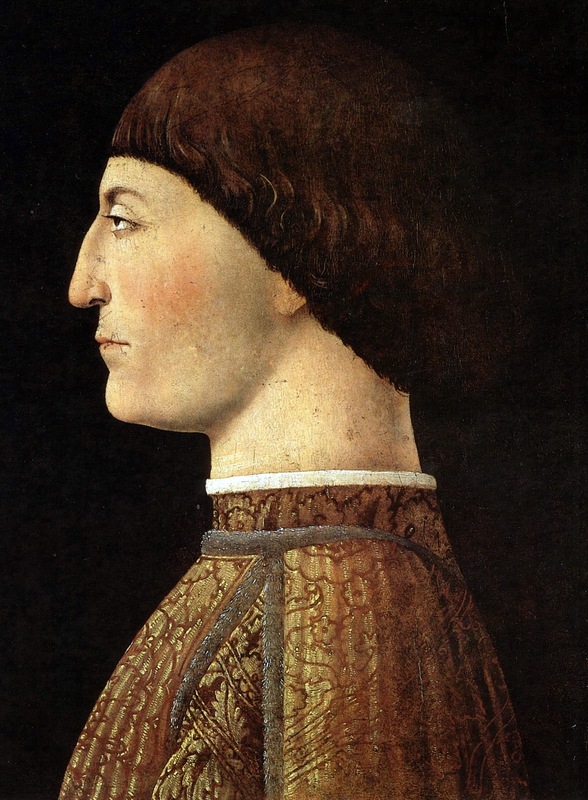 His father, Benedetto de’ Franceschi, was apparently a tanner and shoemaker, prosperous enough for his son to become well educated and literate in Latin. 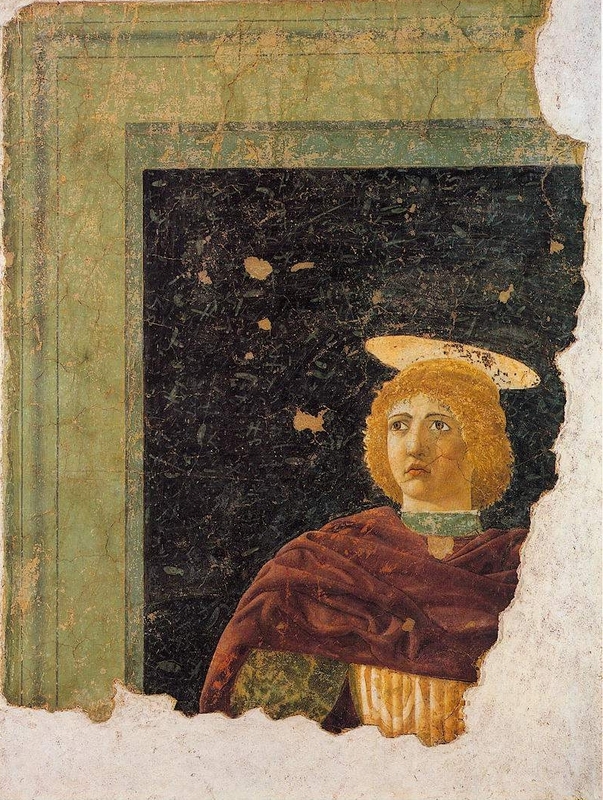 Nothing is known about Piero’s early training as a painter, though it is assumed that he was instructed by local masters who had been influenced by Sienese art. 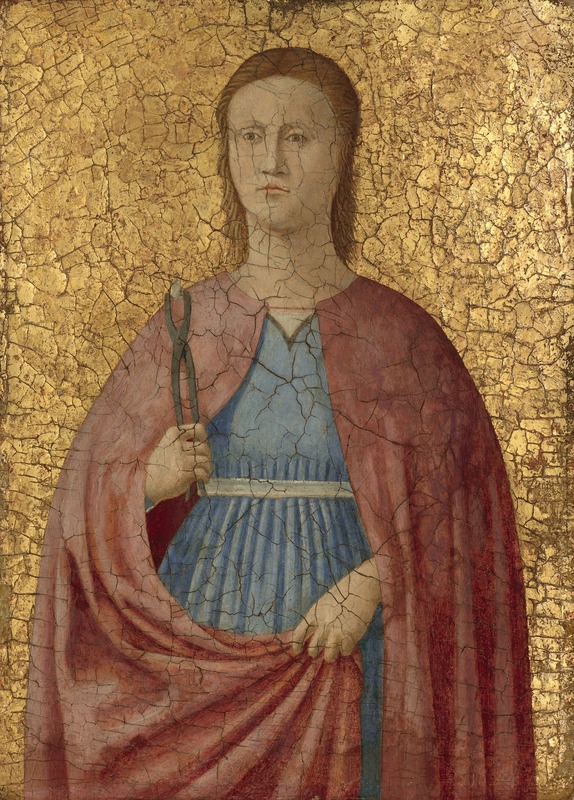 In 1439 Piero worked as an associate of Domenico Veneziano, who was then painting frescoes for the hospital of Santa Maria Nuova in Florence, where the early Renaissance style was beginning to flourish. In Florence he probably studied the statuary of Donatello🎨 and Luca della Robbia, the buildings of Filippo Brunelleschi, and the paintings of Masaccio🎨 and Fra Angelico🎨, and he might have read a theoretical treatise on painting by the humanist and architect Leon Battista Alberti. Undoubtedly, he would have been directed to these luminaries by Domenico Veneziano, whose own works demonstrate a Renaissance emphasis on colour and light as elements of pictorial construction. 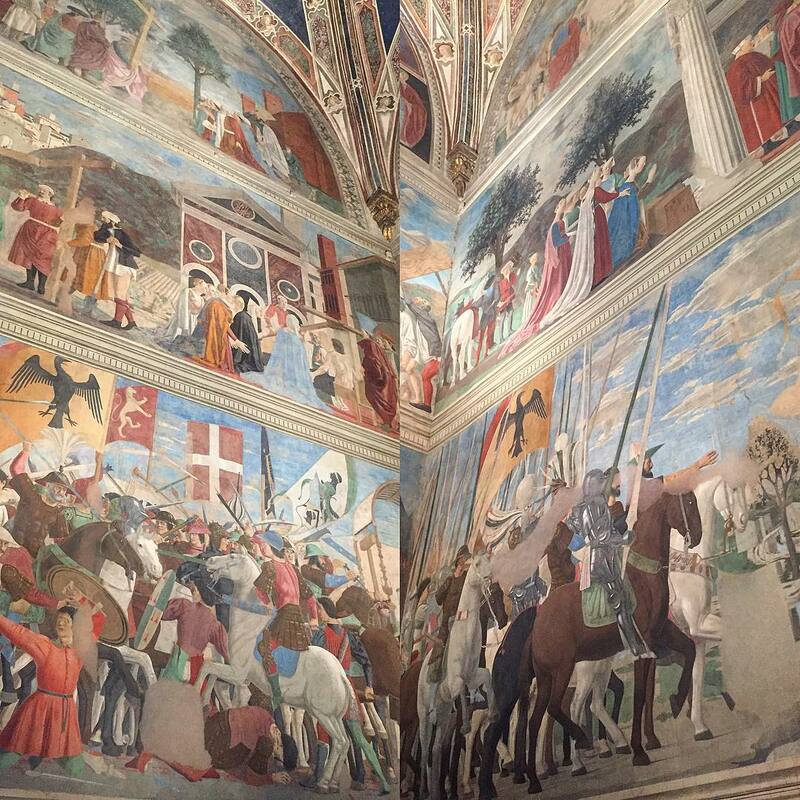 It was this contact with the early Renaissance art🎨 of Florence that provided the foundation of Piero’s own style. 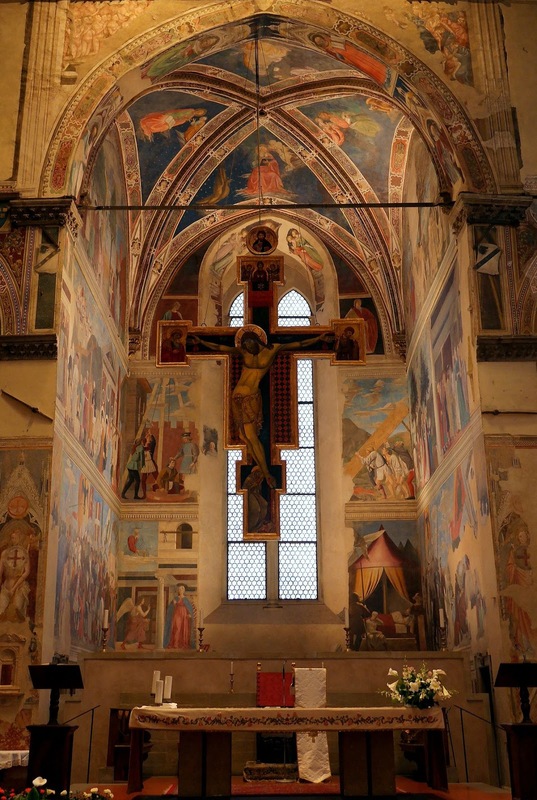 Back in Sansepolcro by 1442, Piero was elected to the town council. 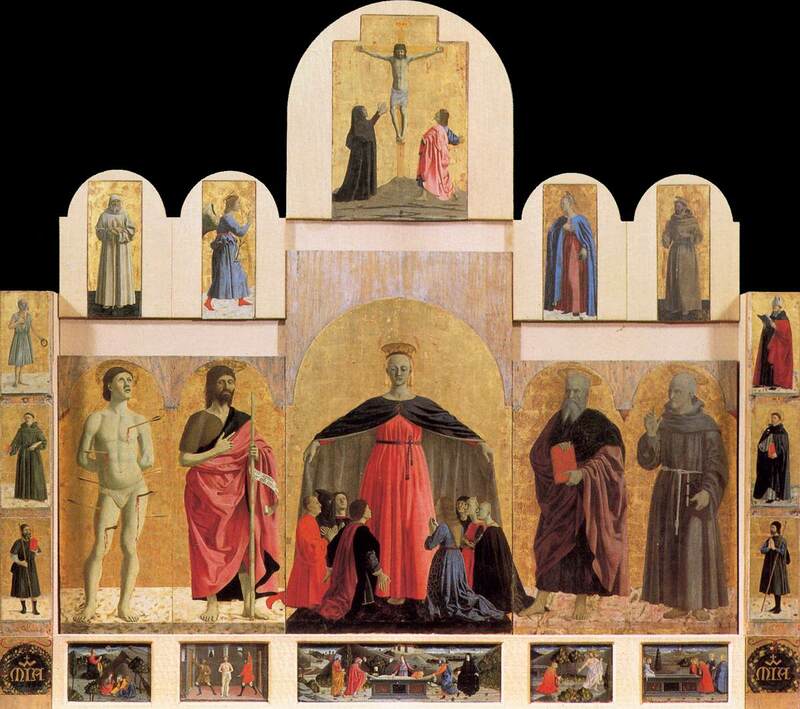 Three years later the Confraternita della Misericordia commissioned a polyptych from him. 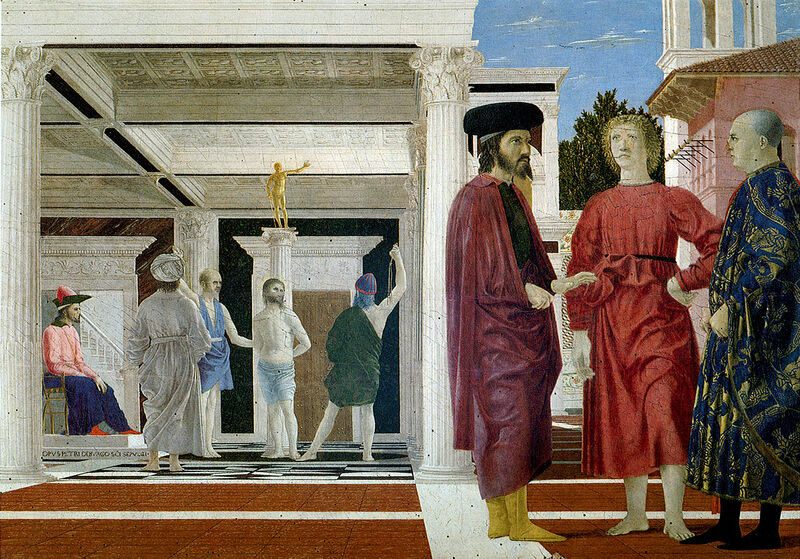 The Misericordia Altarpiece shows Piero’s indebtedness to the Florentines Donatello and Masaccio, his fondness for geometric form, and the slowness and deliberation with which he habitually worked - for the Misericordia altarpiece was not completed until 1462. 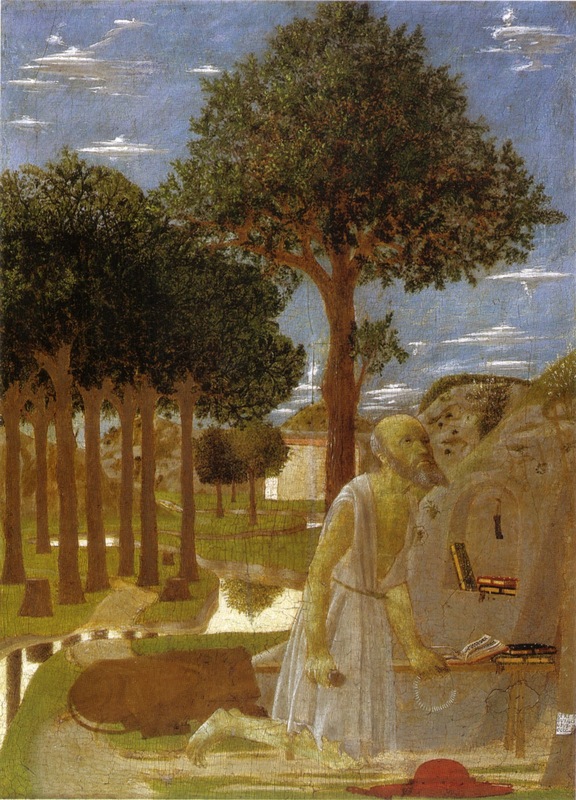 Periodic retreat to the provincial isolation of Sansepolcro seems to have been necessary for Piero’s work. For the rest of his life he alternated between the calm of Sansepolcro and contact with the humanistic life of the Renaissance in artistic and intellectual centres such as Ferrara and Rimini. 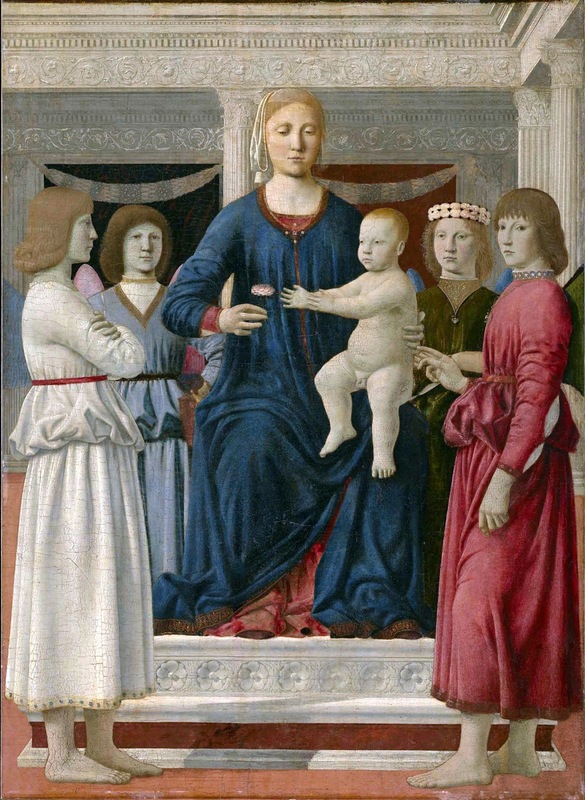 Around 1448 Piero probably worked in the service of Marchese Leonello d’Este in Ferrara, where he may have been influenced by northern Italian art. 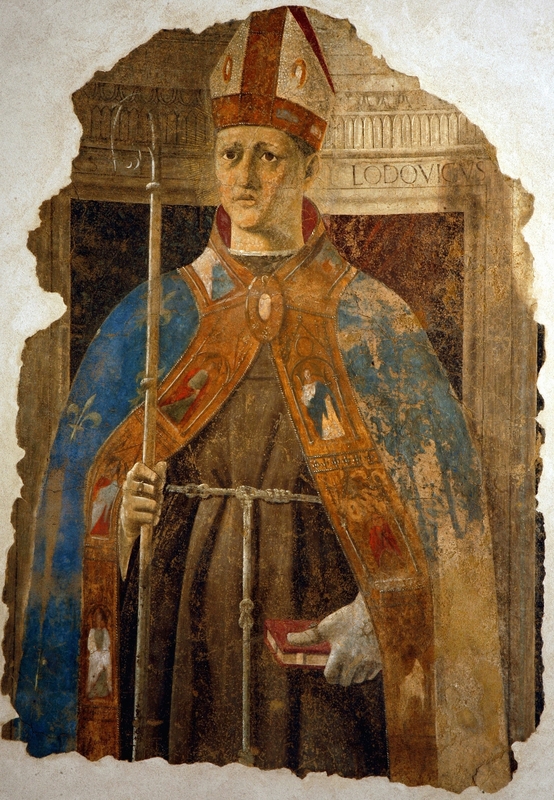 In 1451, at another northern Italian city, Rimini, he executed a splendidly heraldic fresco (i.e., resembling a heraldic emblem in design) of Sigismondo Malatesta Before St. Sigismund in the Tempio Malatestiano, a memorial church built according to the architectural designs of Alberti. 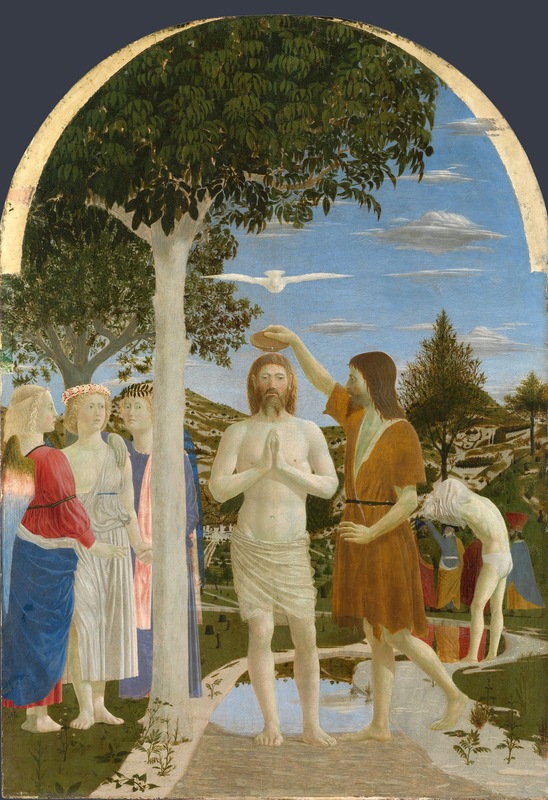 Also to this early formative period before 1451 belongs The Baptism of Christ. 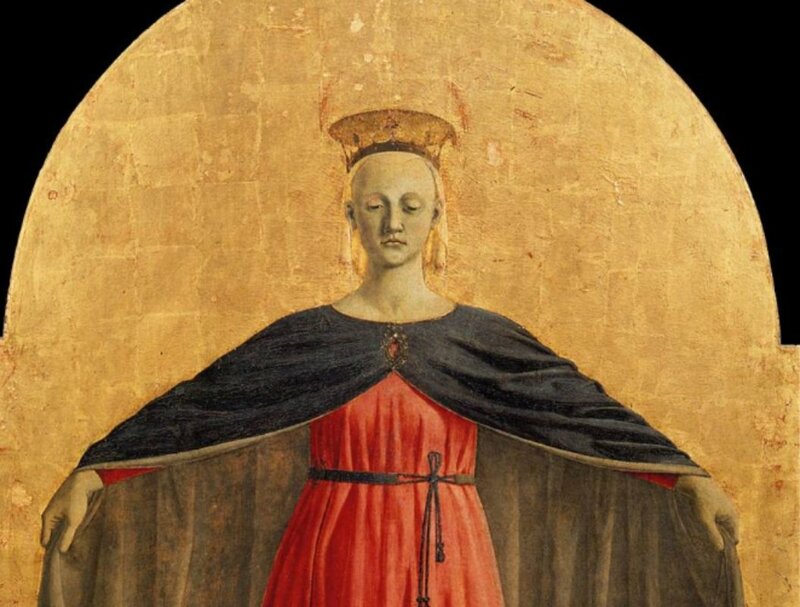 This painting, probably the central panel for an altarpiece for the Pieve of Sansepolcro, shows the elements that remained a constant in Piero’s style to his death. The vigorous volume of the figures, the spatial definition, and, above all, the very original use of colour and light - his paintings appear almost “bleached” - define a style that has all the elements of the Renaissance but that remained one of the most original of all times. 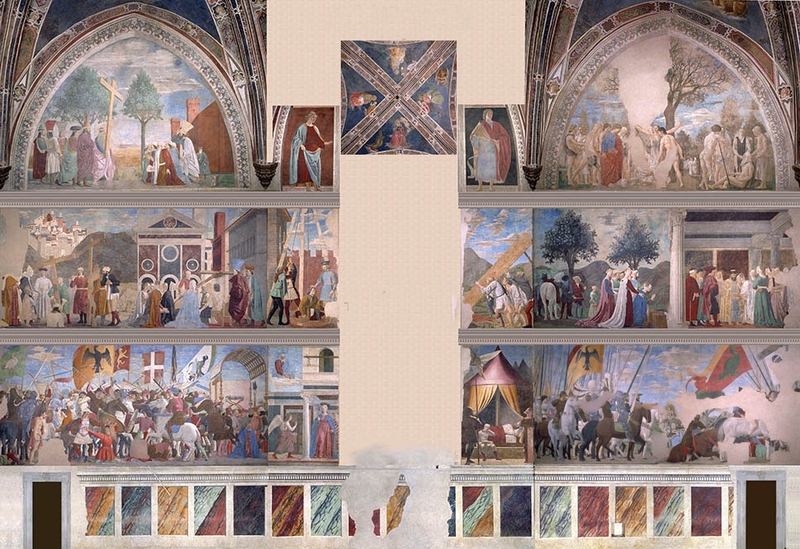 Piero della Francesca’s mature style is revealed in frescoes painted in the choir of the church of S. Francesco at Arezzo. 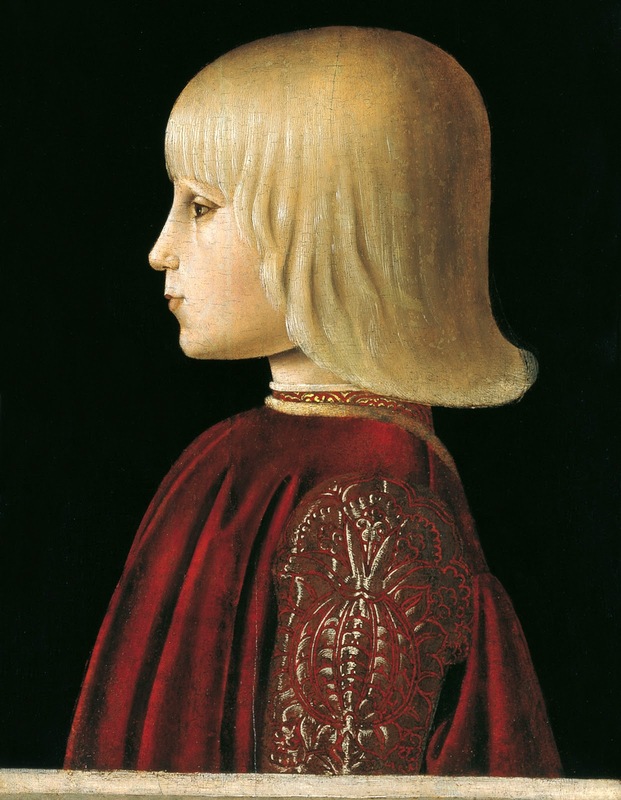 The decorations had been begun in 1447 by the elderly Bicci di Lorenzo, who died in 1452; Piero presumably was retained to complete the work shortly thereafter. The narrative cycle The Legend of the True Cross was completed by 1466. Its simplicity and clarity of structure, controlled use of perspective, and aura of serenity are all typical of Piero’s art at its best. 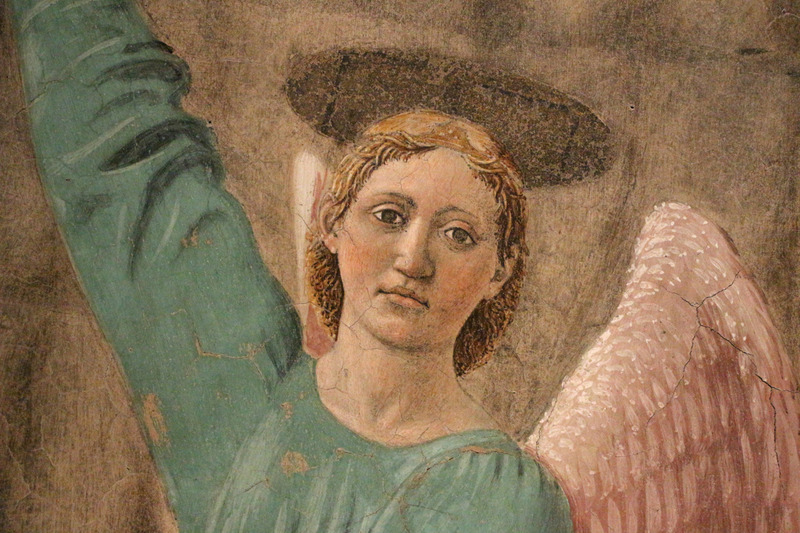 Contemporary with the Arezzo cycle are a fresco of the Magdalen in Arezzo cathedral, the Resurrection in the Palazzo Comunale at Sansepolcro, and Madonna del Parto in the chapel of the cemetery at Monterchi. 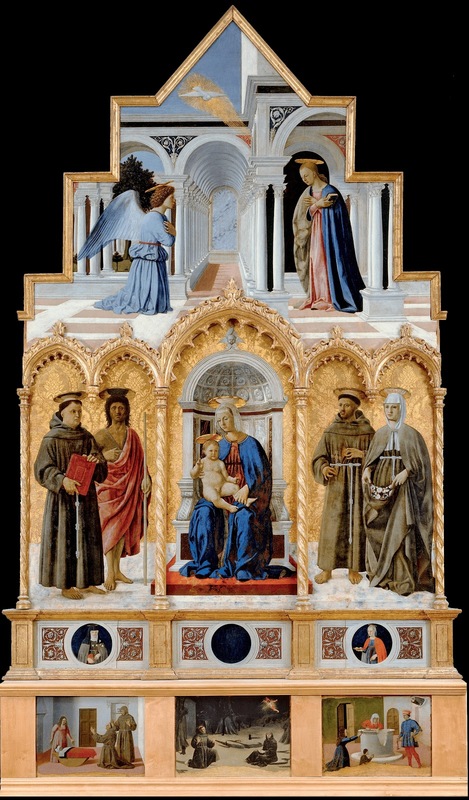 In 1454 a burgher of Sansepolcro, Agnolo di Giovanni di Simone d’Angelo, commissioned an altarpiece for S. Agostino that Piero, characteristically, did not complete until 1469. 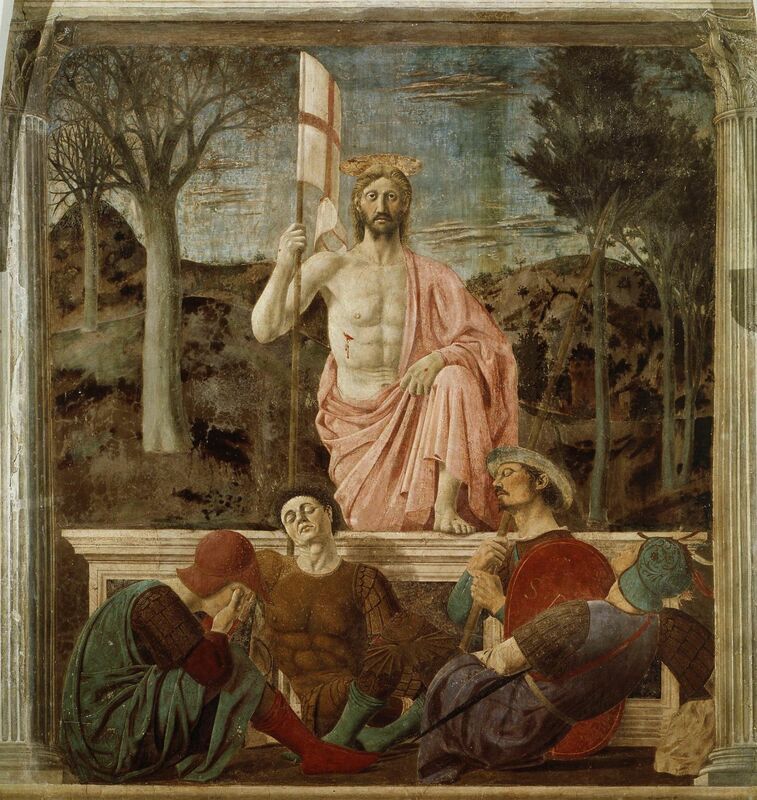 The surviving panels of the altarpiece reveal Piero’s interest in the creation of monumental human figures through the sculptural use of line and light. 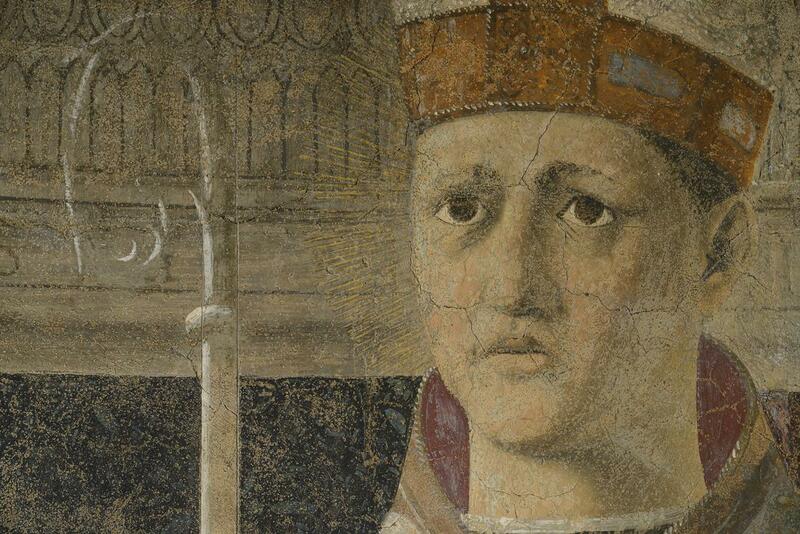 In 1459 Piero was in Rome to paint frescoes (now destroyed) for Pope Pius II in the Vatican. St. Luke (Sta. Maria Maggiore), executed at the same time, was probably done by assistants in the studio he had established in Rome. More fruitful was Piero’s long association with Count (later Duke) Federico da Montefeltro, whose highly cultured court was considered “the light of Italy”. 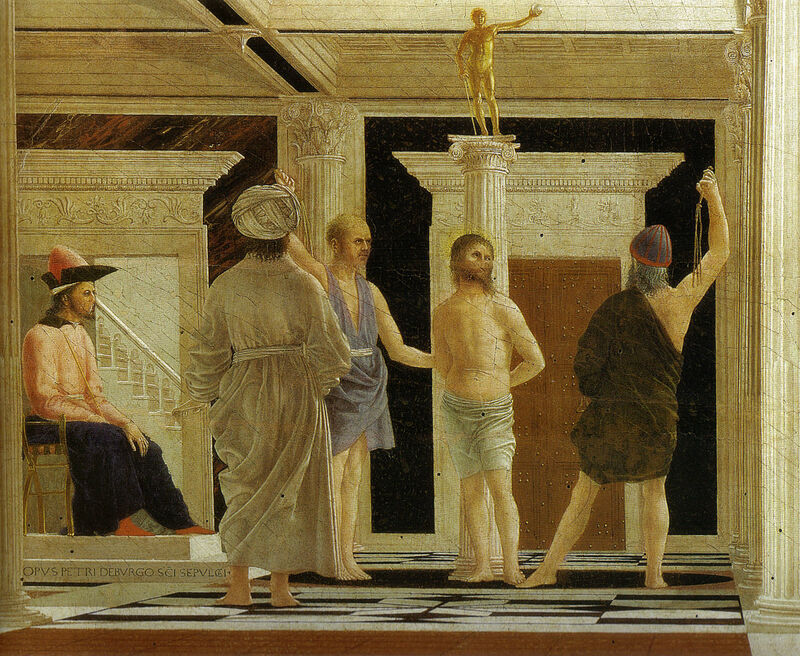 In the late 1450s Piero painted The Flagellation of Christ, the intended location of which is still debated by scholars. Its lucid perspectival construction contrasts with treatment of the subject wherein Christ is relegated to the background while three unidentified figures dominate the foreground. The content of the picture has indeed become the focus of modern academic controversy. 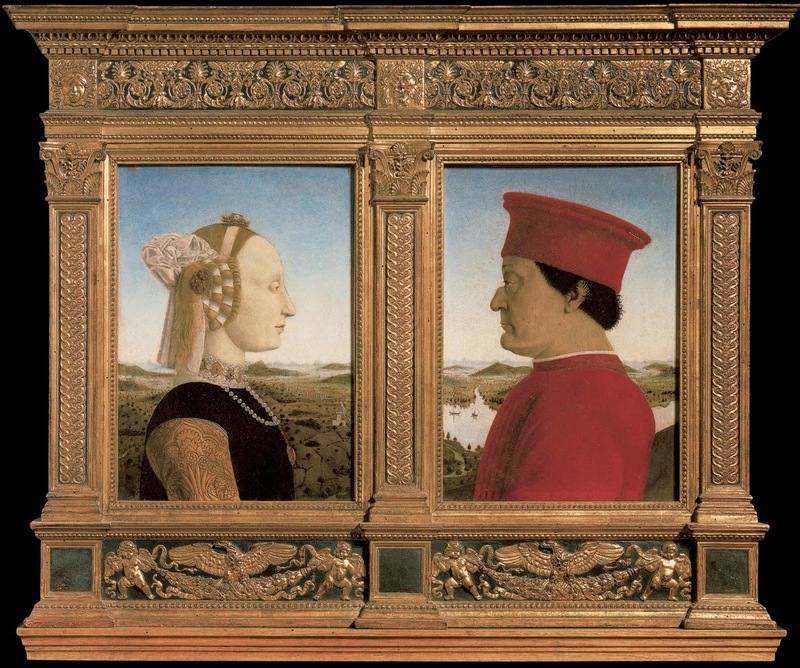 A famous diptych portrait of Duke Federico and his consort, Battista Sforza, was probably begun to commemorate their marriage in 1465. The paintings show Piero’s respect for visual fact in the unidealized features of the Duke and in the enchanting landscape backgrounds, which also indicate that he had discovered Netherlandish painting. The reverse depicts the couple in a triumphal procession accompanied by the Virtues. The Duke reappears as a kneeling donor in an altarpiece from S. Bernardino, Urbino. He, the Madonna and her child, and accompanying saints are placed before the apse (semicircular choir) of a magnificent Albertian church. 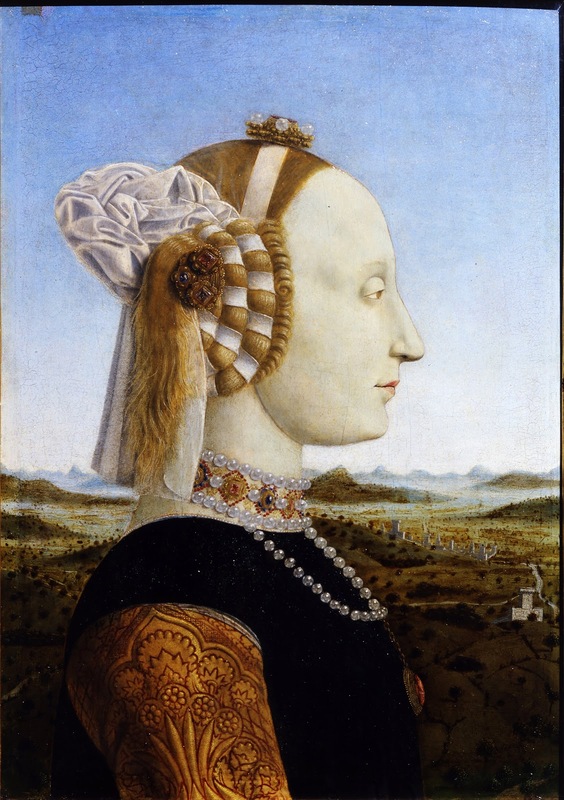 The painting may have been a memorial to Countess Battista, who died after giving birth to the couple’s ninth child and first son, and it has been dated between 1472-1474. The altarpiece is one of the most accomplished Renaissance presentations of forms in space and exerted a decided influence on the development of monumental devotional paintings in northern Italian and Venetian art. 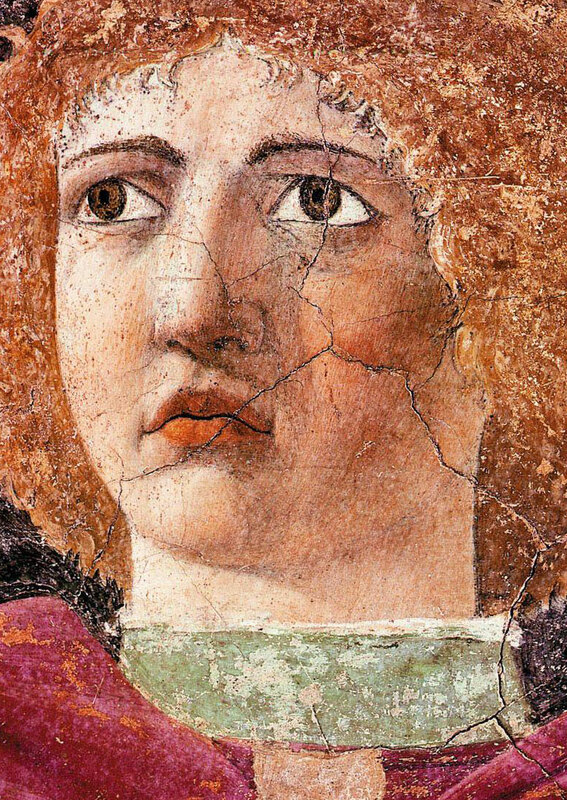 The last two decades of Piero’s life were spent in Sansepolcro, where paintings, now lost, were commissioned by local churches in 1474 and 1478. 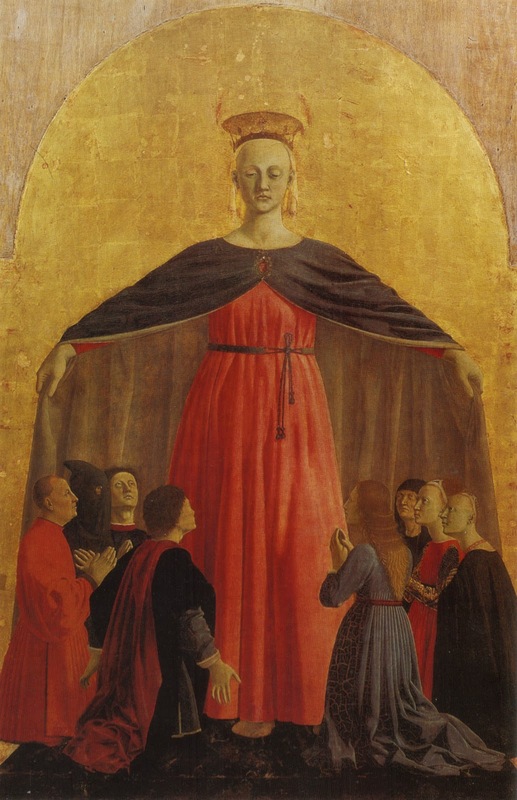 In 1480 Piero became prior of the Confraternita di San Bartolomeo. Among the few extant paintings from this period are the harmonious Nativity, the Madonna from the church at Sta. Maria delle Grazie near Senigallia, and an awkwardly constructed altarpiece in Perugia, Madonna with Child and Saints. 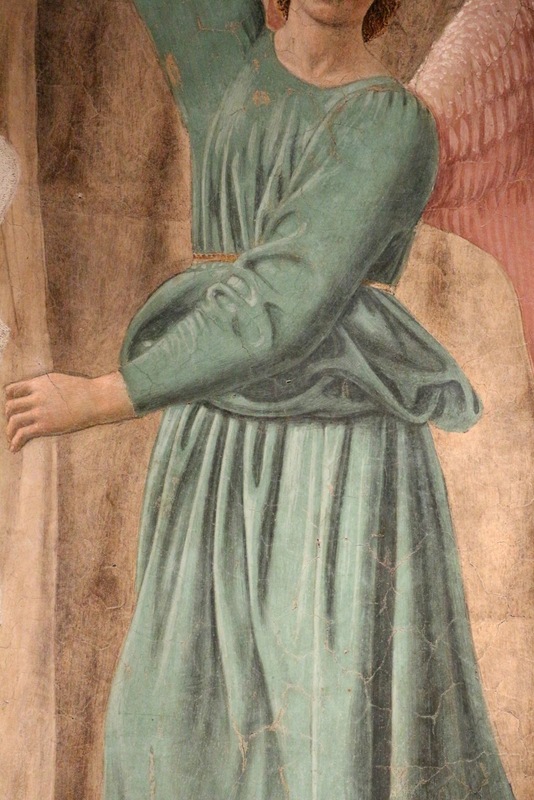 The Annunciation from that altarpiece, however, indicates that Piero’s interest in perspectival problems remained keen. In his old age Piero seems to have abandoned painting in favour of more abstruse pursuits. 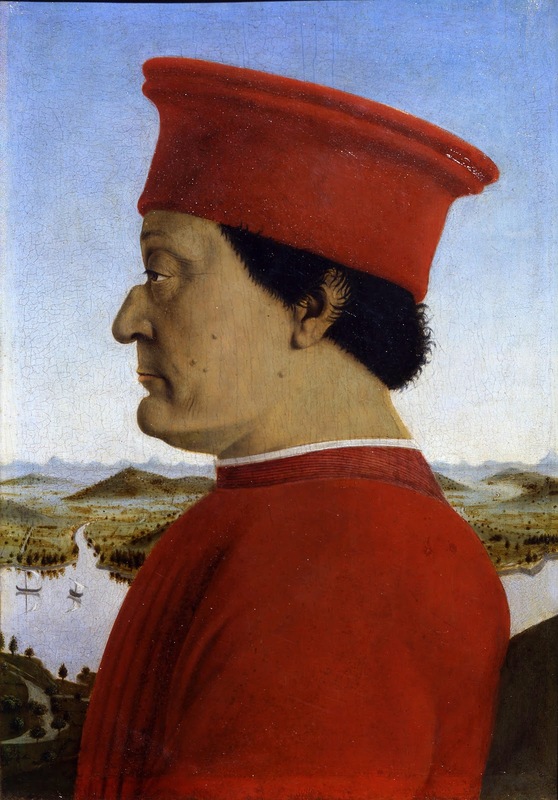 Between 1474 and 1482 he wrote a treatise on painting, De prospectiva pingendi (“On Perspective in Painting”), dedicated to his patron, the Duke of Urbino. In its range of topics and method of organization, the book follows Alberti and the ancient Greek geometer Euclid. The principal manuscript, in Parma (Biblioteca Palatina), was handwritten by the artist himself and illuminated by him with diagrams on geometric, proportional, and perspectival problems. A second treatise, the De quinque corporibus regularibus (“On the Five Regular Bodies”), written and illustrated some time after 1482, follows Plato and Pythagoras in dealing with the notion of perfect proportions. Del abaco (“On the Abacus”) is a pamphlet on applied mathematics. Piero’s fascination with geometry and mathematics is a corollary of his own art; his manner of theoretical expression owes much to his mentor Alberti and is analogous to that of his younger contemporary Leonardo da Vinci; the rigour and logic of the arguments, however, are unique to Piero. 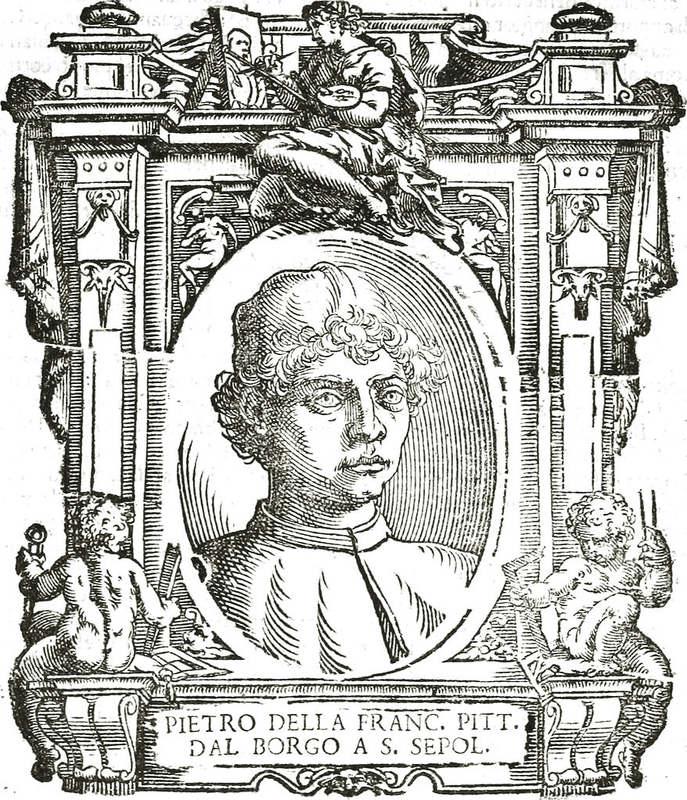 A reliable 16th-century tradition claimed that Piero was blind in his last years. If true, this must have occurred after 1490 because several autographs from that year survive. Moreover, his will of 1486 refers to the painter as aged but sound of mind and body. 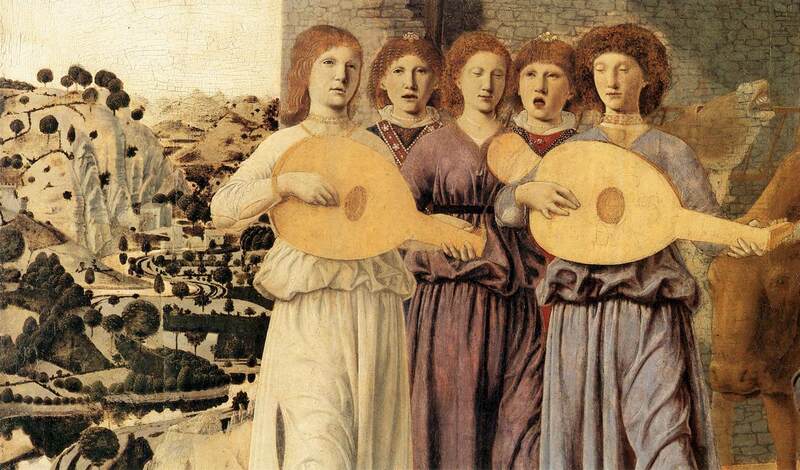 Piero did not establish a lasting tradition in central Italy. 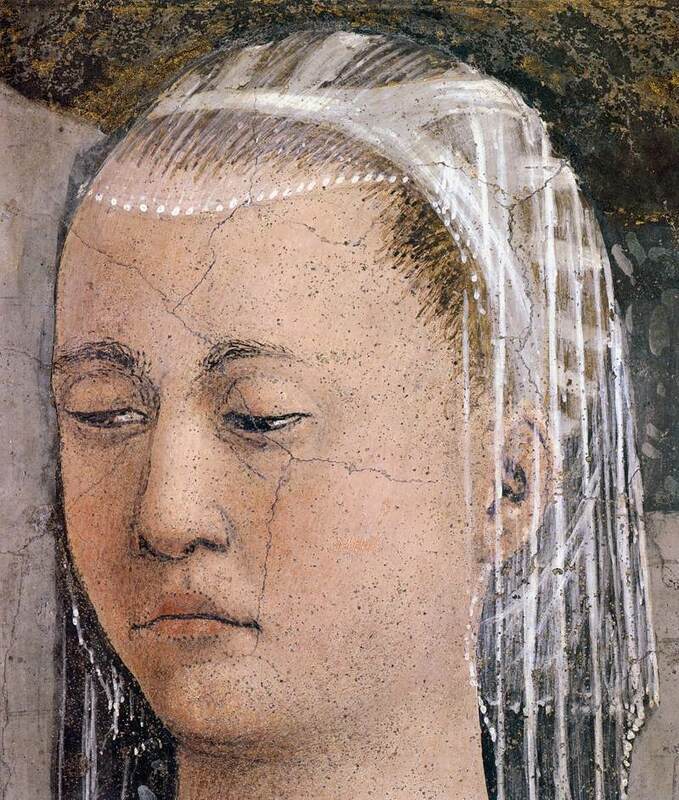 Luca Signorelli and Perugino, who are presumed to be his most important pupils, followed the examples of other masters. Although Piero’s reticent art had little influence on the experiments of his great Florentine contemporaries, he enjoyed great fame for his scientific contributions. In 1497 he was described as “the monarch of our times of painting and architecture”, and the biographer Giorgio Vasari gave him high praise two generations later. In the 20th century, Piero’s career has been reconstructed and his position reevaluated, giving proper credit to both the science and the poetry of his art. | Paul F. Watson © Encyclopædia Britannica, Inc.
Pièro della Francesca (o Piero dei Franceschi) - Pittore (Borgo S. Sepolcro 1406 o 1412 - ivi 1492); figlio di Benedetto dei Franceschi (cognome noto anche nella forma della Francesca, che poi si è imposta nella tradizione) e di Romana di Pierino da Monterchi, è uno dei più grandi pittori del Rinascimento🎨 dopo la generazione di Masaccio🎨 e dell'Angelico. Dopo una prima educazione con maestri di grammatica e di abaco, svolse il suo apprendistato artistico forse presso un pittore locale, Antonio di Anghiari, col quale risulta ancora collaborare nel 1436. Nel 1439 lavorò agli affreschi, perduti, di S. Egidio, a fianco di Domenico Veneziano. La sua prima opera pervenutaci è il Polittico della Misericordia (San Sepolcro, Museo Civico), commissionato nel 1445 dalla confraternita di Borgo ma nel 1554 ancora incompiuto: i santi Giovanni Battista e Sebastiano e la Crocifissione rivelano, pur nell'impianto con il fondo d'oro, decisi riferimenti a Masaccio🎨, la cui arte segnò profondamente la sua formazione, innestandosi sulla lezione di Domenico Veneziano nell'uso del colore e della luce, elementi determinanti nella costruzione dello spazio. 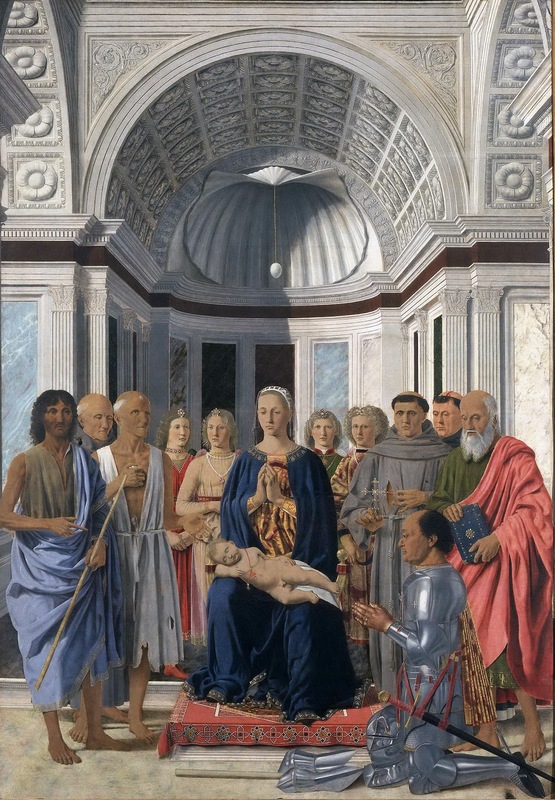 La Madonna della Misericordia, tavola centrale del polittico, e i santi Giovanni Evangelista e Bernardino, eseguiti dopo il 1454, mostrano una maturità che denuncia l'arricchimento delle esperienze di P. al di là degli Appennini. Tra il 1446-1454 P. trascorse infatti gran parte della sua vita a Pesaro, a Ferrara, a Rimini, ad Ancona. È soprattutto a Ferrara, forse ancor prima della morte di Lionello d'Este nel 1450, che dovette ricevere gli stimoli più significativi, in un ambiente raffinato e dotto, dove al collezionismo di gemme e medaglie si affiancava l'apprezzamento della pittura fiamminga, dove la familiarità con i Lendinara gli permise di approfondire l'interesse per la prospettiva, già stimolato a Firenze. Se del soggiorno ferrarese una traccia è data dalle copie degli affreschi con Battaglie eseguiti nel palazzo estense, tradotte in modi manieristici verso il 1540 (Londra, National Gallery; Baltimora, Walters art gallery), a Rimini rimane, firmato, l'affresco nel Tempio Malatestiano, con Sigismondo Pandolfo Malatesta inginocchiato davanti a s. Sigismondo (1451): seppur degradata per la perdita dei molti interventi eseguiti a secco sull'affresco, tecnica ricorrente in Piero, quest'opera s'impone per la nuova solenne e misurata/">misurata costruzione spaziale (certamente la presenza di L. B. Alberti a Rimini può essere stata occasione di proficue discussioni), che si unisce alla costante attenzione per il colore e per la luce. Le tavole con S. Girolamo penitente (Berlino, Gemäldegalerie) e S. Girolamo con un devoto (Venezia, Gall. dell'Accademia, commissionata forse dal veneziano G. Amadi), databili tra il 1450-1452, riflettono la personale elaborazione delle novità fiamminghe nella resa del paesaggio, che, inondato di luce, costituisce con il suo realismo poetico l'ambientazione del Battesimo di Cristo (Londra, National Gallery), realizzato dopo il 1450 per una chiesa di Borgo. 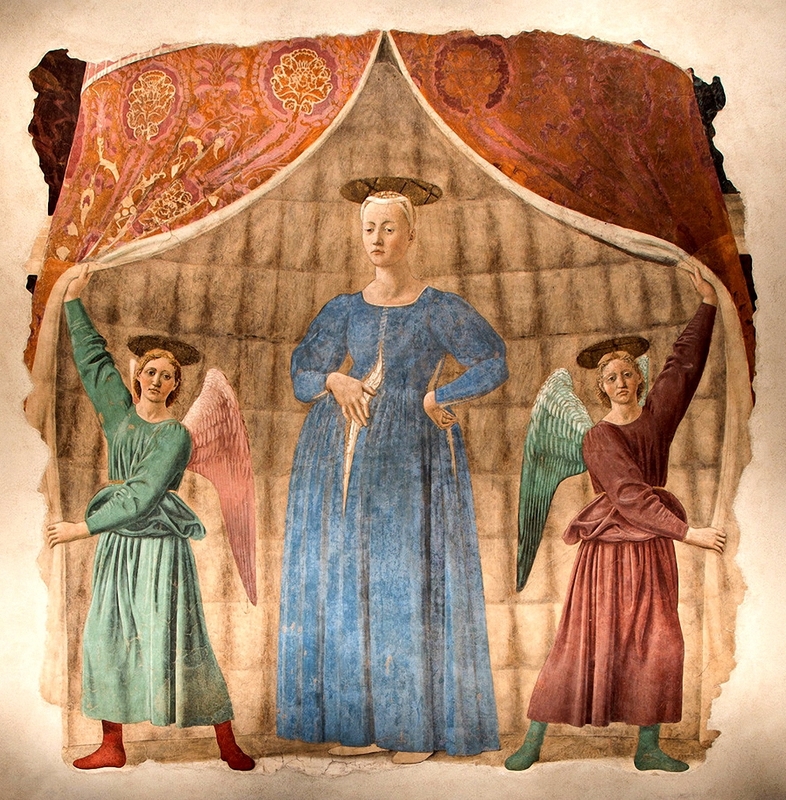 Se già in quest'opera alcuni elementi della composizione (come i tre angeli) sono stati occasione di indagini interpretative, la tavola firmata con la Flagellazione (Urbino, Gall. nazionale delle Marche) rimane l'opera di P. più enigmatica e discussa, con ipotesi che comportano differenti datazioni (1447-49 o dopo il 1457) e differenti committenti (Francesco Sforza, signore di Pesaro; Jacopo degli Anastagi, concittadino di P. e consigliere di S. P. Malatesta a Rimini; Federico da Montefeltro): i tre personaggi in primo piano sono stati variamente interpretati come contemporanei all'episodio evangelico, narrato in secondo piano, o connessi ad avvenimenti dell'epoca di Piero; l'intento del dipinto è stato considerato nell'ambito della devozione domestica o della commemorazione di avvenimenti personali o politici, o addirittura un puro pretesto di una esercitazione prospettica. 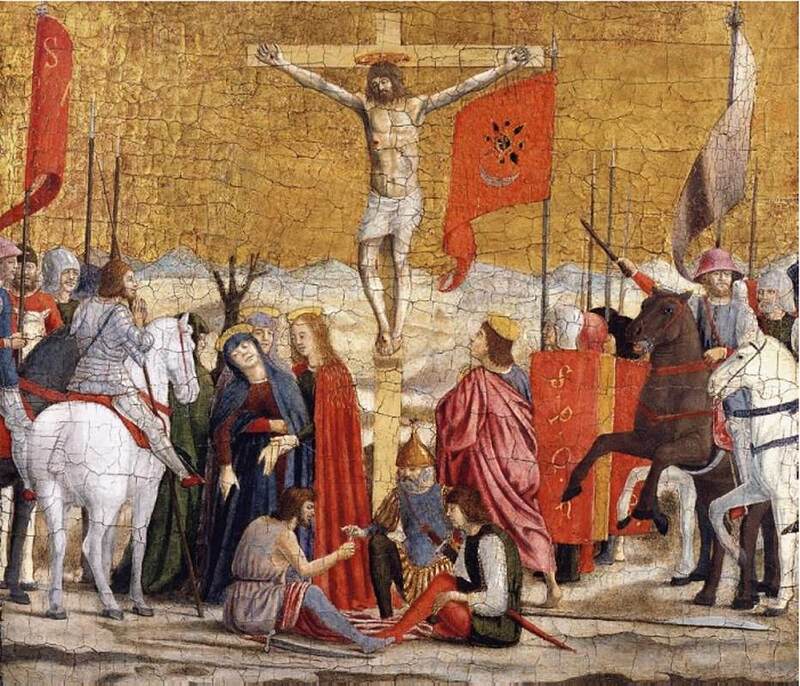 Tra il 1454-1457 Piero realizzò il ciclo di affreschi sulla Leggenda della vera Croce🎨, nel coro di S. Francesco ad Arezzo, già commissionato a Bicci di Lorenzo: seguendo, più che una logica cronologica, un nesso di corrispondenze tipologiche che rimandano da una parete all'altra, la storia, che non ha come unica fonte la Legenda aurea e sembra riferirsi ai drammatici avvenimenti contemporanei (la caduta di Costantinopoli), si svolge in un ordine compositivo di ampio respiro, regolato da sapienti rapporti tra figure e sfondi architettonici o paesistici, mentre l'uso della tecnica a secco, con una tempera grassa, permette effetti straordinarî di colore e di luce. Nella Morte di Adamo🎨 (dal cui corpo secondo la leggenda sorse l'albero della Croce) emana un senso di umanità primordiale, eroicizzata nel vigore dei corpi ignudi; nella Visita della regina di Saba al re Salomone, una scena di vita profana, per effetto della luce, dell'equilibrio fra spazî e volumi, del colore, diviene idealizzata e solenne; nell'Annunciazione la colonna tra l'arcangelo e la Vergine mette in evidenza la solidità architettonica della figura di Maria; nel Sogno di Costantino🎨, la scena notturna si rivela con una luce improvvisa e tagliente; nella Vittoria di Costantino🎨 la luminosità diurna decanta una spettacolare parata guerresca. 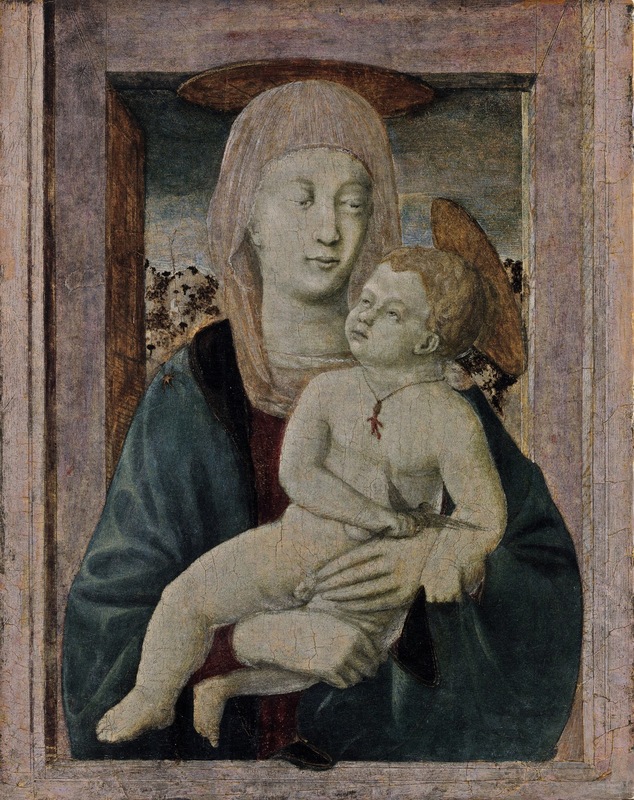 Nel tempo dell'esecuzione di questo complesso poderoso e nel decennio successivo cadono opere altrettanto incisive, eseguite sempre ad affresco: la Resurrezione per il Palazzo comunale di Borgo (ora Museo Civico), la Madonna del parto per una chiesa di Monterchi (poi cappella del cimitero), la Maddalena nel duomo di Arezzo, l'Ercole eseguito per la sua nuova casa di Borgo (ora a Boston, Isabella Stewart Gardner museum). 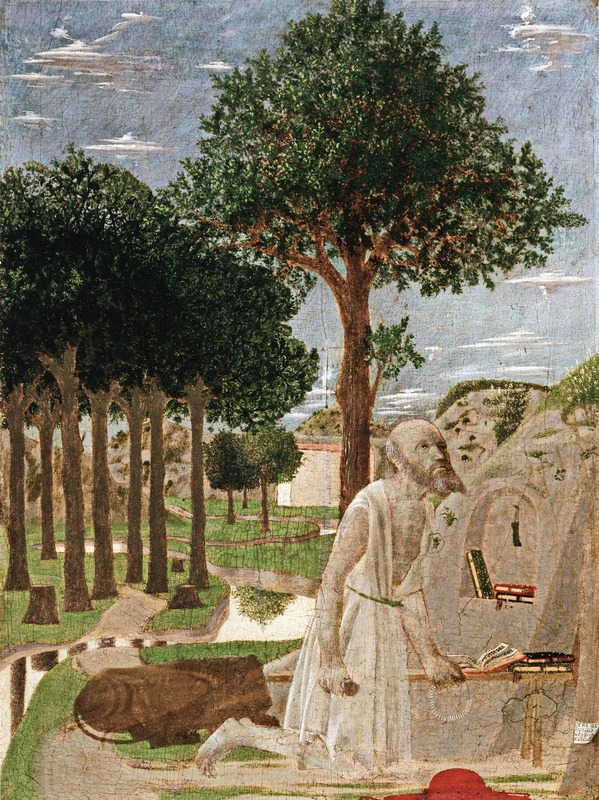 E ancora il Polittico di S. Agostino per gli agostiniani di Borgo (smembrato: Lisbona, Museu nacional de arte antiga; Londra, National Gallery; New York, Frick Collection; Milano, Museo Poldi Pezzoli) e il Polittico di S. Antonio, coronato dalla bella Annunciazione, a Perugia (ora nella Gall. naz. dell'Umbria). Nel 1459 P. fu invitato a Roma a decorare alcune stanze in Vaticano: distrutti questi affreschi, rimangono del suo soggiorno romano due degli Evangelisti eseguiti per G. d'Estouteville in S. Maria Maggiore. 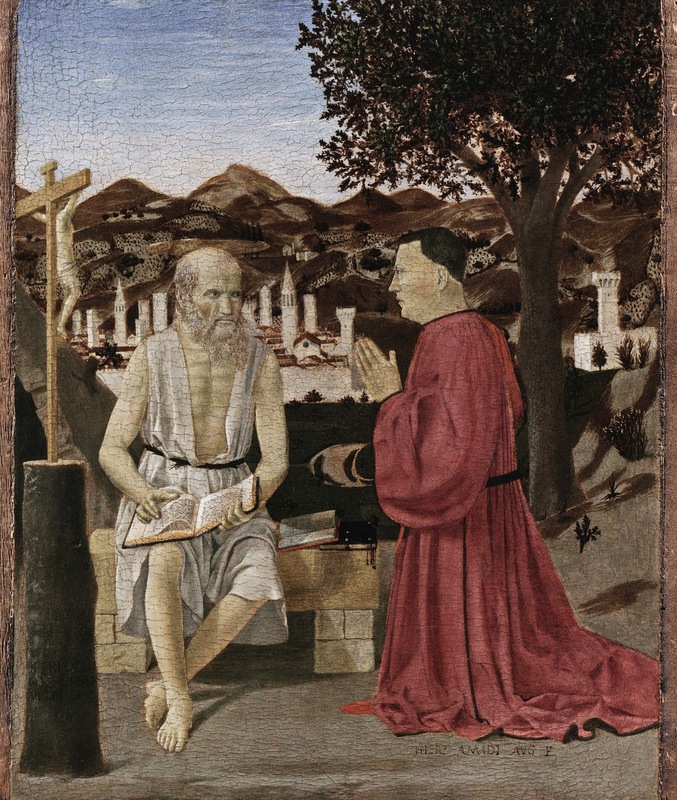 Dopo il 1460 Piero è strettamente legato alla corte di Urbino: per i Montefeltro dipinse il dittico con i ritratti di profilo di Federico e Battista Sforza con uno sfondo di paesaggio e sul retro i loro "trionfi" (1465, Uffizi); un senso più intimo di accostarsi al soggetto si rivela nella Madonna di Senigallia (Urbino, Gall. naz. delle Marche), dove i grigi luminosi si accendono di luci perlacee, mentre nella Madonna, santi e angeli e Federico di Montefeltro in adorazione (Milano, Pinac. di Brera), destinata a S. Bernardino, la chiesa mausoleo di Federico, la concezione architettonica di P. si svolge pienamente nella grande nicchia che accoglie il gruppo divino in una perfetta sublimazione di forma-spazio-luce-colore.